I wanted a bike for as long as I can remember and in 1998, while looking for a Suzuki GS500E I found a Suzuki GS550E, which is quite different than the 500E even though there's only one numeral different in the name. It was a great bike for learning how to ride though and I quite enjoyed it. It never gave me any problems. I was thinking about getting a Yamaha YZF 600R. It was sport bike of the year in 1997 and I heard good things about it, but I never found one for a good price. 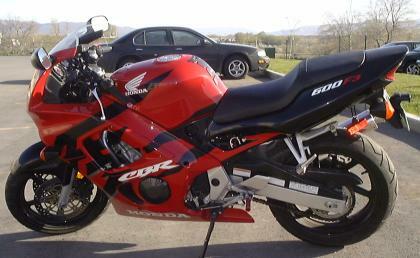 I bought the 1998 Honda CBR600F3 pictured above in March 2001. It is a great bike and handles like a dream. I don't know what the official top speed is, but when I was on a long straightaway I rolled the throttle as far as it would go and I was at about 145mph. I think the engine just couldn't overpower the wind resistance at that speed. So, as far as I'm concerned it has a top speed of 145mph.